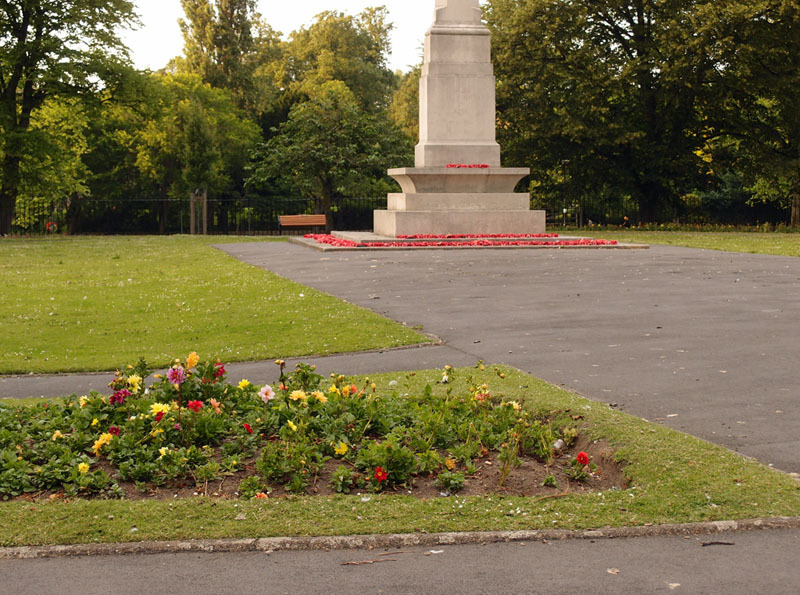 So having failed to find a bench in the Triangular Gardens, let’s wander across the road to the Memorial Gardens. Here we do find benches, and quite a few of them. Before sitting down you might want to wander beyond the benches and have a look at the flowers. 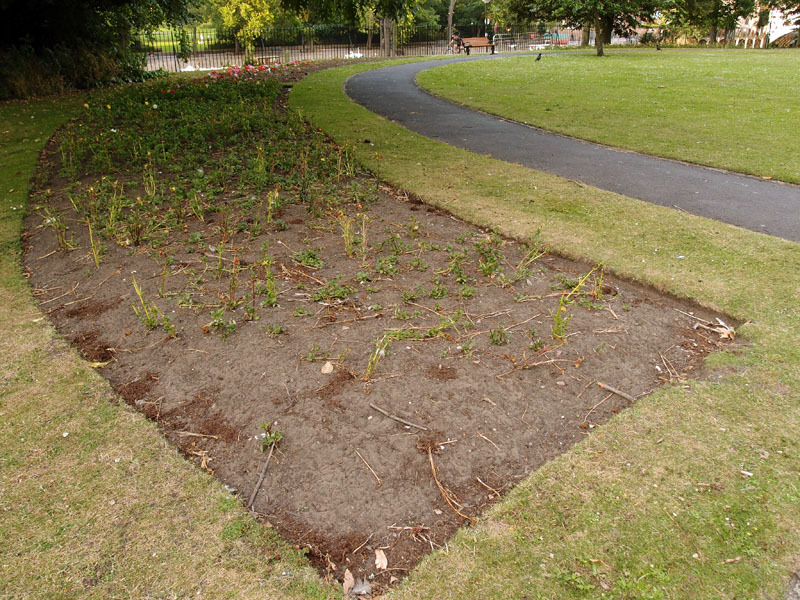 Some of these flowerbeds appeared to have been planted with dahlias too. Things may have improved since, but it seemed unlikely that these would ever flourish into an impressive floral display. Remnants of the plants struggled on. They may have ended up in this state because of dry weather and no additional watering, or because they’d been trampled or eaten by passing wildlife. It doesn’t matter really, what caused it. What does matter, or it mattered to me, is that this is a waste of money, and resources. 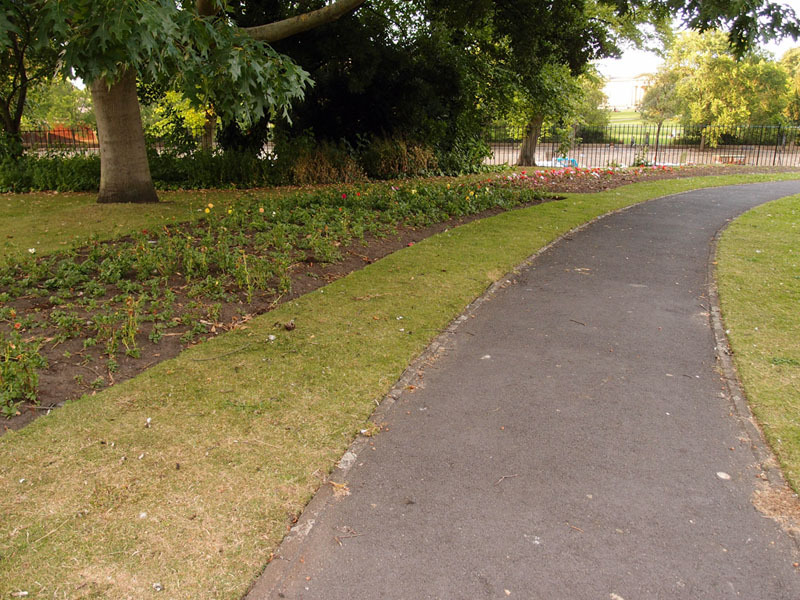 The type of plants used in these formal park displays are annuals, and so only last one summer anyway, so seem a bit frivolous, in an age of austerity. We’ll have different opinions on whether the initial spend is justified. But perhaps, if this is the result, then it would be better not to bother. It might be better to fill in the flowerbeds, turf them over, if an impressive display can’t be managed even in the height of summer. Or perhaps we could modernise our approach and dispense with the old-style formal bedding schemes full of annuals that get thrown out at the summer’s end. As bees need our help, and buzzing bees and butterflies enhance the tranquility and calm of a garden, perhaps the beds could be filled with perennial plants attractive to bees? Perhaps we can all muck in to maintain them? 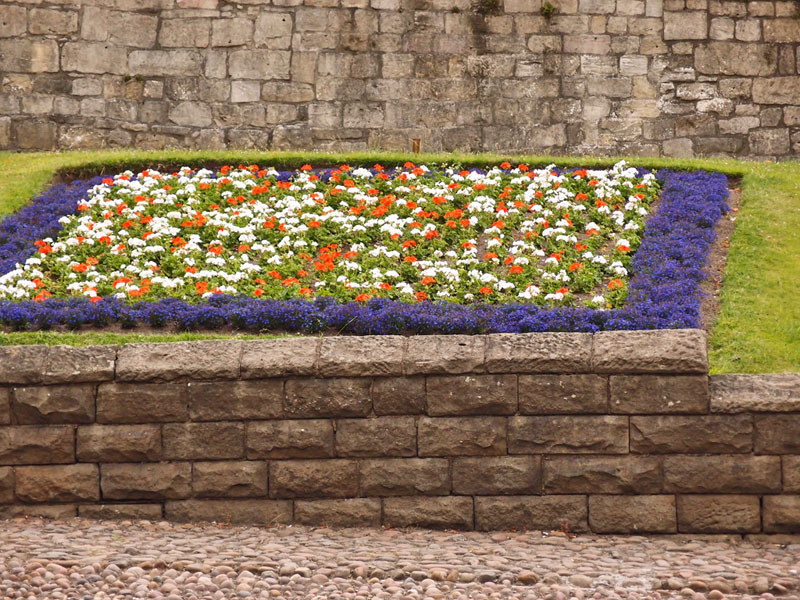 Rather than leave you with those rather dull and depressing images, let me lead you round the corner to the other side of the city walls, where on the mound there’s a very smart and colourful display. Formal bedding schemes can look good. Perhaps this one has been better maintained because it’s overlooked by the Cedar Court Grand? By Lisa @YorkStories • 9 August 2015 Details To link to this page's proper location please use the > permalink.